Absolutely stunning.....This spectacular heirloom tomato produces big, sprawling, indeterminate, regular-leaf tomato plants that yield moderate to large crops of 1-2 lb. 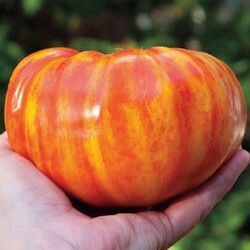 rib-shouldered bi-colored beefsteak tomatoes with gold flesh with beautiful red streaks running throughout. As fruits ripen they have a rainbow appearance: greens on the shoulder, yellow, orange, gold in the middle, and red on the blossom end. Fruit often has dynamic red splotches inside and on bottom. Very juicy and fruity sweet. Good disease resistance. A late producer. Great for slicing thick into sandwiches or salads. Probably our all time favourite.